Defensive focus is a point of emphasis for the Portland Winterhawks as they prepare to meet the Spokane Chiefs in a Western Hockey League first-round playoff series that features two of the best offenses in the league. "Both teams are going to say that they want to play well defensively because both teams can explode, they can score," says Winterhawks VP/GM/coach Mike Johnston. "Both teams' power plays are good. I think both teams rely on their power play a little bit." Johnston hopes his team will have much better focus than it did on the final weekend of the regular season, when Seattle scored 11 goals over two games to knock away home ice advantage from Portland for the series with Spokane. The Chiefs finished one point ahead of the Winterhawks to claim second place behind Everett in the U.S. Division, and thus will play host to the first two games of the best-of-seven series. The games Friday and Saturday at Spokane begin at 7 p.m. The big question looming over the start of the series is the status of Portland's Cody Glass. The star Vegas Golden Knights prospect missed 30 regular-season games and has played in only four of the last 21 games because of a knee injury. Johnston, as is the norm come playoff time, did not detail the status of Glass, listing him as day to day. He says the same about key 18-year-old defenseman John Ludvig, who missed the final five regular-season games. Since returning to the injury list, Glass has been rehabilitating with Golden Knights personnel in Las Vegas but was expected to return to Portland this week in advance of the playoffs. With Glass, Portland has one of the most productive power plays in the league because the 19-year-old is an excellent passer with elite vision. 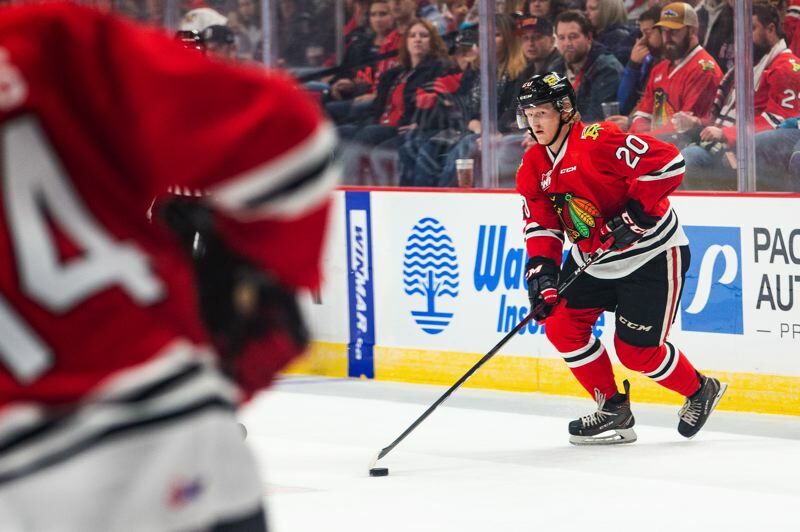 Combined with Joachim Blichfeld, who won the WHL scoring title despite Glass' absence, the Hawks have the kind of high-end firepower that can lead a playoff run. "If we get him back, it would be huge," Blichfeld says. The other notable question for the Winterhawks is how their younger players handle significant roles in playoff hockey. That's especially true up front, where players such as 16-year-old Seth Jarvis (16 goals, 23 assists), 17-year-old Jaydon Dureau (12 goals, 17 assists), 16-year-old Cross Hanas (8 goals, 14 assists), 16-year-old Robbie Fromm-Delorme (3 goals, 11 assists) and 18-year-old Michael Kvasnica (8 goals, 12 assists) played big roles as WHL rookies. "We've never really played young guys as high up in the lineup as we have this year," Johnston says. "Everything they've done so far has shown that they can handle it. I think they're ready. We'll find out Friday night." Forward Lane Gilliss knows the jump in intensity for playoff games might surprise the rookies at the start of the series, but won't likely linger. "The first (playoff) game is so much quicker, faster, everyone finishes hits. It's just a lot more intense," Gilliss says. "I think we have pretty intelligent young guys so it shouldn't be too hard for them to get in a groove and understand what playoff hockey is all about." Intelligence will be important. Portland had the second most penalty minutes in the league (1,000). Giving power plays to a Spokane team that converts a league-best 29.1 percent of the time would not be good. Gilliss, a 19-year-old in his fourth season, has three goals and four assists in 14 career playoff games. But his first job is to make things difficult for opposing forwards. "It's key for me to focus on my defensive play because they've got so much firepower up there," Gilliss says. "I'd like to chip in offensively, too, but mostly try to shut down some of their key players." Spokane finished the regular season with the third-most goals in the league, averaging 3.93 across the 68-game schedule. Portland finished sixth at 3.79 goals. Spokane doesn't have an individual scorer close to Blichfeld's league-leading 53 goals and 114 points, but the Chiefs have plenty of scoring depth. Spokane has 10 double-digit goal scorers, six with more than 20 goals. That includes Los Angeles Kings 2017 second-round pick Jaret Anderson-Dolan and San Jose 2017 sixth-round pick Jake McGrew. Anderson-Dolan missed significant time with an early-season injury but leads Spokane in points per game at 1.34. Riley Woods, 20, leads the Chiefs with 75 points, and 17-year-old Adam Beckman (32 goals, 30 assists) was second among WHL rookies with 62 points. On the back end, Spokane is led by Ty Smith, the 2017 first-round draft pick of the New Jersey Devils, and Toronto Maple Leafs 2018 fifth-round draft pick Filip Kral. A healthy Chiefs team enters the playoffs playing its best hockey of the season, winning eight of 10. And Spokane has been much better at home than on the road this season. Despite consecutive weekend losses to Seattle, the Winterhawks say they will take confidence from a March 12 win over Everett into the playoffs. "We have a really good team, and we showed that throughout the year," Blichfeld says. "Everybody has a lot of skill, and when we work hard, we're a tough team to beat. We've got to bring our game every night in the playoffs. If we play like we did against Everett the other day it should be a fun series for sure."